The large amounts of international VoIP traffic that flow to Chile make it possible to earn good money on GSM termination. 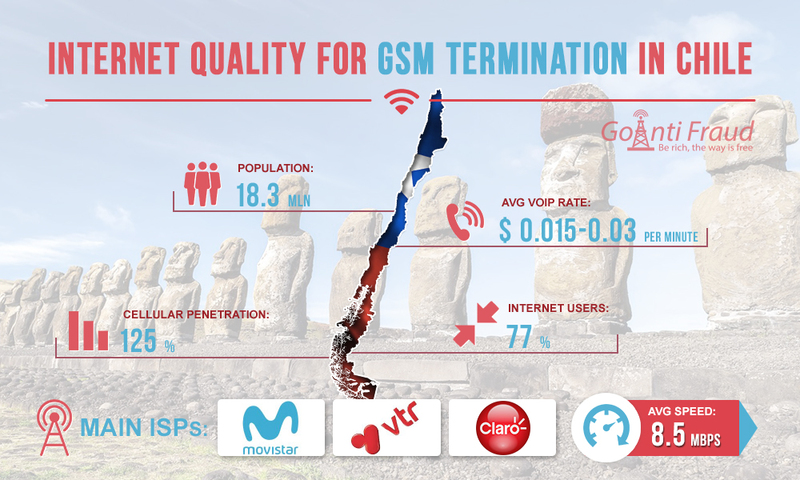 Chile has a well-developed cellular communication sector, with the mobile penetration rate reaching 125%. But what about the Internet service market? To efficiently terminate calls, you need a high-speed Internet that works without interruptions. In Chile, Internet penetration is high enough as for the subregion (77%). The Internet is used by more than 14.1 million people. Broadband services are considered to be among the cheapest in South America. At the same time, the Chilean Internet is the fastest among Latin American countries. The average download speed is 8.5 Mbps. Due to the fact that Chile has improved its economic situation over the past decade, the government invests enough in the telecommunications sector. The local population is receptive to new technologies, and providers are actively introducing services based on LTE networks and fiber-optic technology. In the broadband sector, a lot of Internet providers are actively competing with each other. The market leader is Movistar, the second and third place are occupied by VTR Globacom and Claro Chile. Due to the high competition, the tariffs for Internet services are low. If you plan to make money on converting VoIP calls to mobile ones in Chile, you can place multi-channel equipment in each location. Since the rate in this direction is low, it makes sense to terminate large amounts of traffic to get high profits.